GoAquatix was founded on a disruptive idea: to connect employees at aquatic & pool facilities to the home office and the home office to the employees at the facilities – no matter where they are around the globe. Our platform delivers on that idea every day. GoAquatix makes your aquatic/pool facility a “Smart” facility – “Real-Time” information. Facility hourly, daily, and weekly duty and maintenance requirements. Geo-location based time keeping system. Verification of Lifeguard Certifications are current and up-to-date. Track swim test results to reduce liability. Receive instant updates from aquatic facilities at your office. Receive payables faster by allowing your customer to pay for contract. Work or maintenance through their admin portal. Keep up with how your offsite employees are viewed based on a rating system from your customer. 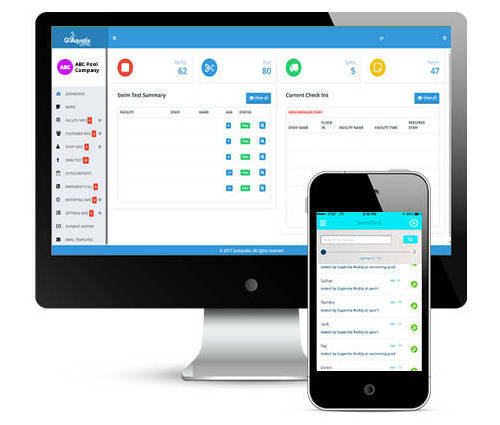 Conduct training on aquatic facilities, lifeguard requirements, and maintenance through your employee’s mobile app. Capture images of your aquatic facility and store them for your records as needed for maintenance, repairs, or construction.